Business is changing. Technology disrupts. You get to decide what happens. You need the right people with the right skills at the right time. That's where we come in. The Right People. The Right Skills. The Right Time. Decide What Happens. to reduce risk, improve security and keep threat away. Too many Action Items? Does Your EHS software match current Processes? We can help. Need people who can speak Human and Code? We can help. We are founded and run by software developers. Our founder had a long career as a software developer before starting Decide. This Information Technology knowledge base makes us different in how we source, recruit, write job descriptions and understand your technology projects. We solve problems. It’s our competitive advantage. Make it yours with Decide Consulting on your side. How Safe is Your Company from Cyber Attacks? No company is 100% secure from cyber attacks, hackers and ransomware. There is plenty you can do to minimize your risk. Take our cybersecurity self-assessment to find out what things to do first. Is your company able to attract top IT talent? How competitive are your employees’ IT salaries? How much do the Hot IT skills make? 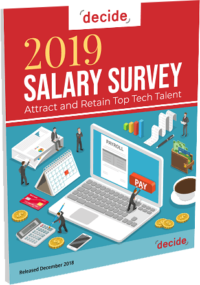 Find out with the 2019 IT Salary Survey book. Our IT staffing team is ranked among the top 25 IT consulting firms in Houston. Leverage our network of top talent to grow your team. Cyber security professionals will have access to sensitive data. Let us vet your candidates for you so you only get qualified candidates. From Java & iOS developers, to analyst & technical roles, our development recruiters are committed to building your team with the very best. Finding the right blend of experience and skills shouldn’t be an off-the-shelf decision. Partner with our seasoned PM recruiters to find the best talent. Business Analyst The IT Business Analyst will act as a key innovator and contributor to the ultimate success of the company's web applications. You will join our development team in building the next generation of our products from the ground up. This is a full-time salaried work from home position with excellent benefits.